If you travel just beyond the quaint town square of Prescott, Arizona, you'll meander through the tall pines until you come upon a campus with a surprisingly modern mission and architectural features. 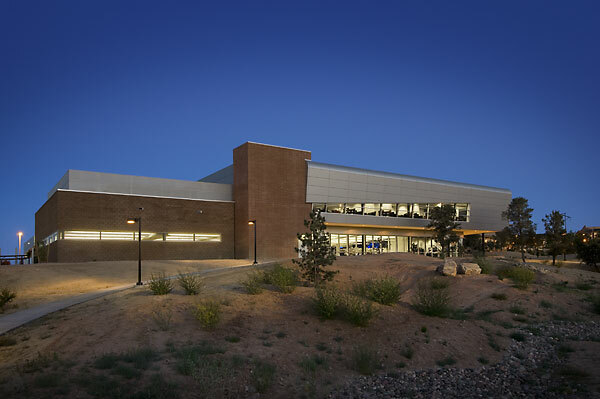 Embry-Riddle Aeronautical University (ERAU) is the world's oldest, largest, and most prestigious university specializing in aviation and aerospace. It is the only accredited, aviation-oriented university in the world with headquarters in Daytona Beach, Florida. The newest building on this high-tech university is the Chris and Stephen F. Udvar-Hazy Library and Learning Center, designed by DLR Group and built by Barton Malow Companies. 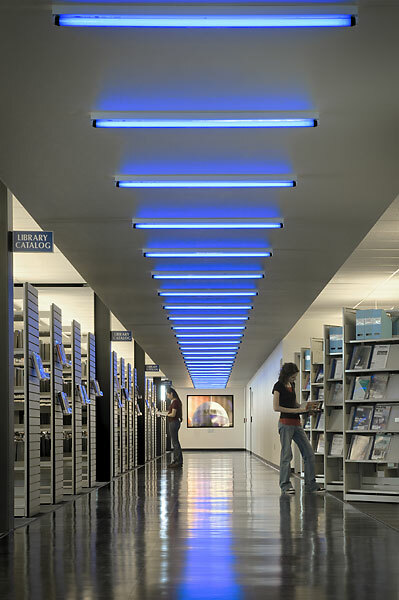 The 32,000 sf library, far from being a traditional university library with classic columns or brownstone face, presents a sleek reflection of a student body engaged in a technological world of cutting-edge aeronautics and engineering. 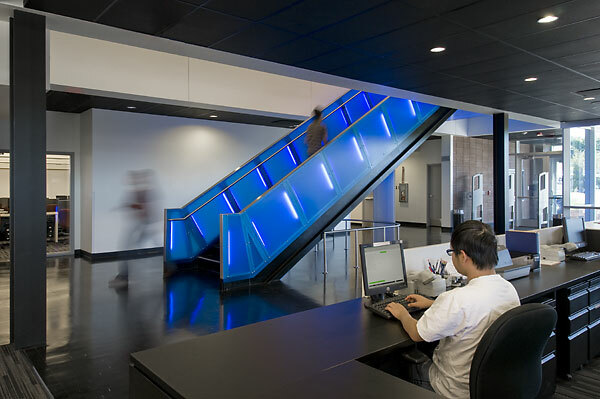 The entry into the building is defined by an internally illuminated monumental stair reflective of a world lit by iPods and monitors. Sarah Thomas, Library Director uses words like phenomenal, incredible and awesome to describe the new facility. "The innovative facility has infused a new spirit into our campus and into the students' living and learning community. The incredible amount of use has doubled, as compared to last year, a testimony that the students have adopted the library as their own gathering place. The features and attributes of the library are well designed to address student needs, with compliments still coming in every day. The multimedia-rich presentation room and collaboration rooms are a high-tech hit," she said. 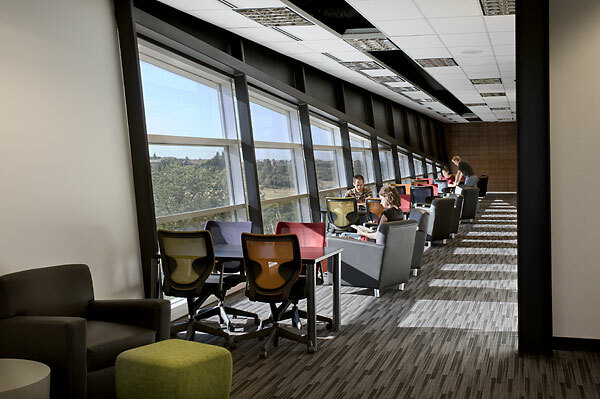 Students enjoy a wide variety of study accommodations including individual nooks, a classic quiet reading room, and open tables and lounge seating with mountain vistas. 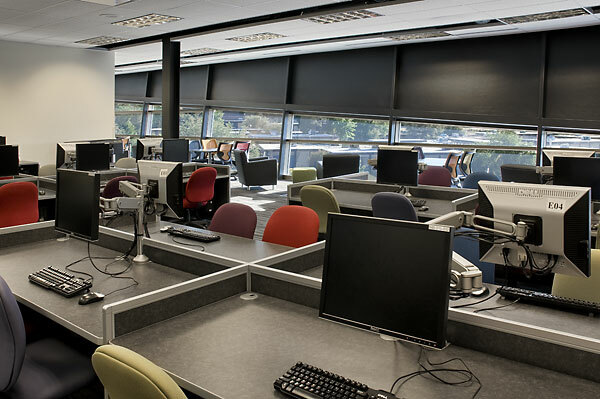 The research instruction classroom provides a state-of-the-art technologies where librarians deliver lectures on how to locate, evaluate and use information. 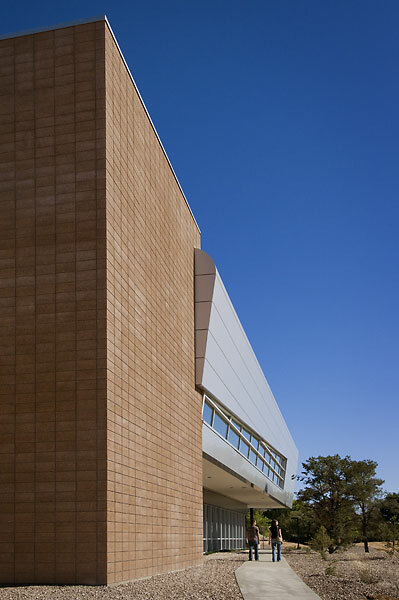 Designing a high-performance building was important to the University. Sustainable features began in the landscape which preserved and restored the indigenous naturalized plantings, and the building nestles into a landscape ridge along its eastern façade. 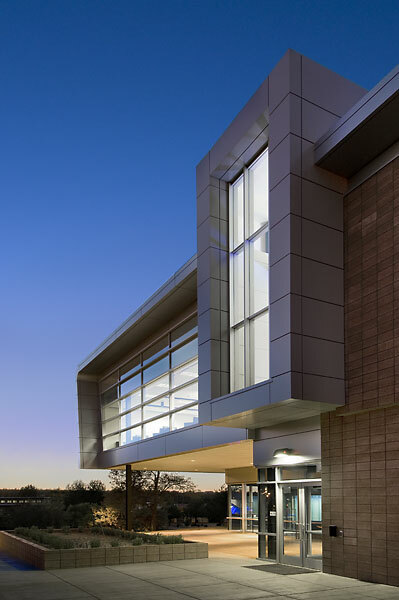 The metal and glass front seem to float above the ground with the second floor cantilevering in two directions, providing entrance shading inherent in the design. Proper solar orientation of the building introduced controlled light into the library, with a north-facing window wall welcoming daylight into the interior while allowing evening passers-by get and a glimpse from the outside into the life of the library. The structure's exterior, simple in concept and compelling in execution, uses concrete masonry, steel and glass. the dramatic structure appears ready to take flight. 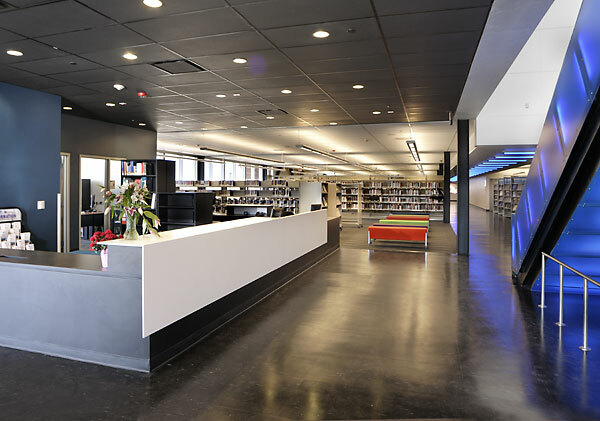 On the interior, the book stacks stand in formation over a black, Tarmac-like flooring with lighting reminiscent of a runway. 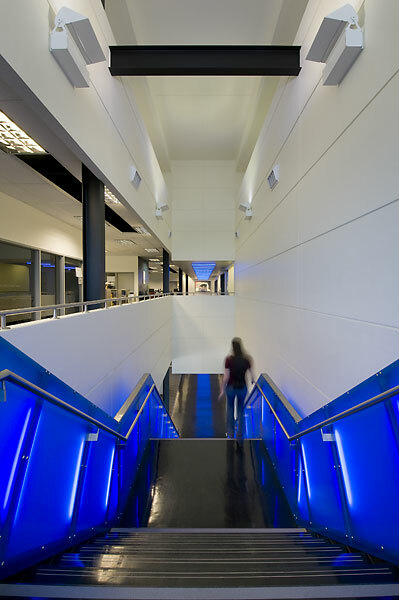 The fluorescent lighting with changeable colored gels illuminate the path which leads to a back-lit photographic mural. Playful furnishings keep this facility from becoming too heavy-handed in technology or aviation, welcoming students and visitors to sit and study, contemplate and collaborate while they explore, study and learn. 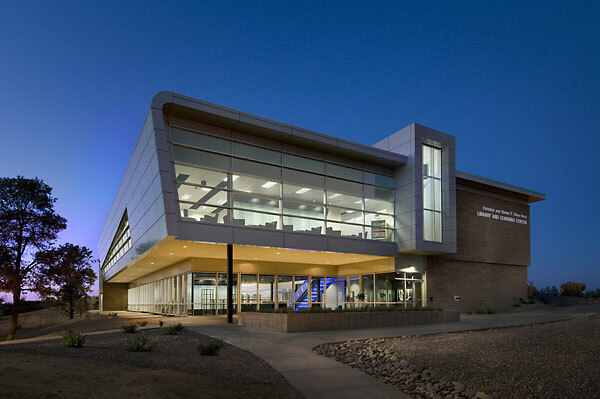 Gary is the Design Leader at DLR Group in Phoenix and was the designer of the Embry Riddle Aeuronautical University's new Library and Learning Center. "I believe that the understanding of context enables design, which is grounded with clarity of intention. In other words, the design should have an apparent idea which is self-apparent in the project. I insist of us, a rigorous intellectual investigation of ideas to ensure that appropriate and inspirational solutions are met. I believe that architecture, like art, should be relevant to the age in which we live."